The RuffNeck offers exceptional durability at a price that meets any budget. The RuffNeck is a "Fixed Height" pole system constructed of 4 1/2" outside diameter galvanized schedule 40 tubing and a 48" direct bury post. The direct rim mount design allows the rim to be mounted through the backboard and into the post, eliminating backboard stress. The backboard is further supported by two tubular braces fixed to the nect of the post. 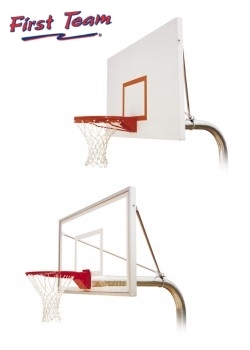 Our unique "nose-cone" backboard mounting design makes backboard installation simple. 48" post to board extension for player safety (NOTE 60" extension is available). (20L) Call or submit this form for IMMEDIATE pricing.